Years ago I fell in love with a drink. Not just any drink, the ubiquitous ‘Cherry-Limeade’ at Sonic. I knew from the first sip, I was done for! I could go there get a treat for my son and my own liquid candy bar with a straw. Only once did I venture into the realm of the frozen yogurt version. No, it was was good, but there was something very clean and refreshing, while satisfyingly sweet about the original. 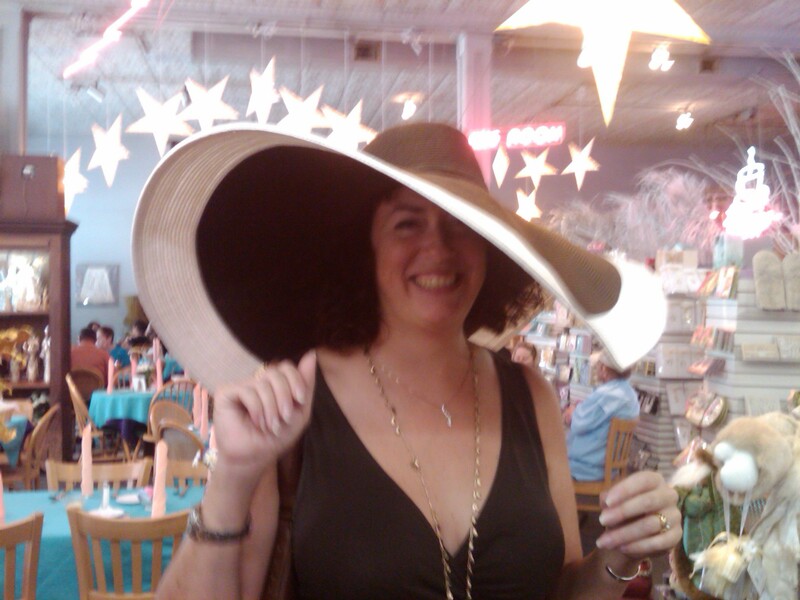 Never the diet version – never – I do have standards. As it turned out, I wasn’t the only one falling over themselves to get this mocktail (seriously – all it needs is rum). There are impostors all over the place. And no, it’s nothing like a ’Shirley Temple’ although, I do see the resemblance. 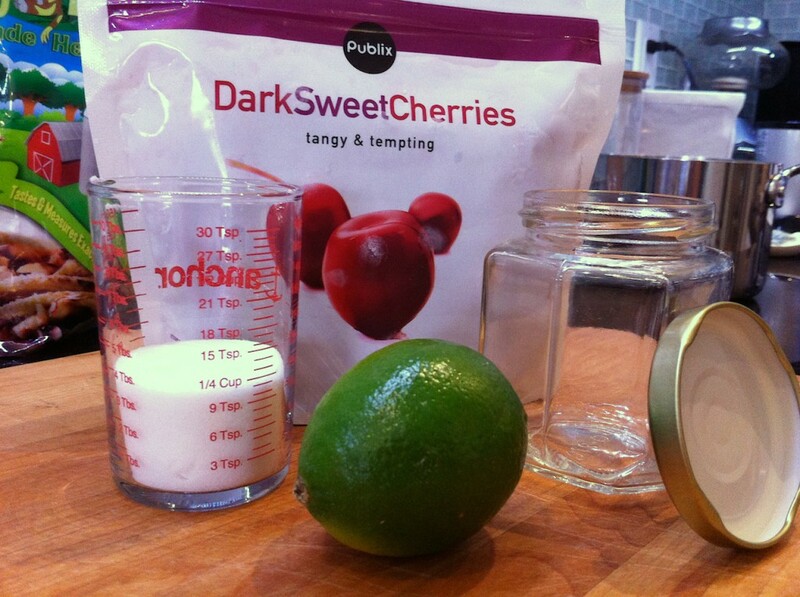 Lime and cherry…who knew. Where am I going with this, well if you know me, you know that I can be distracted easily. Like Dug, the dog in ‘Up’, there’s always a squirrel in my world. The other day I was looking for something to do with leftover pineapple. 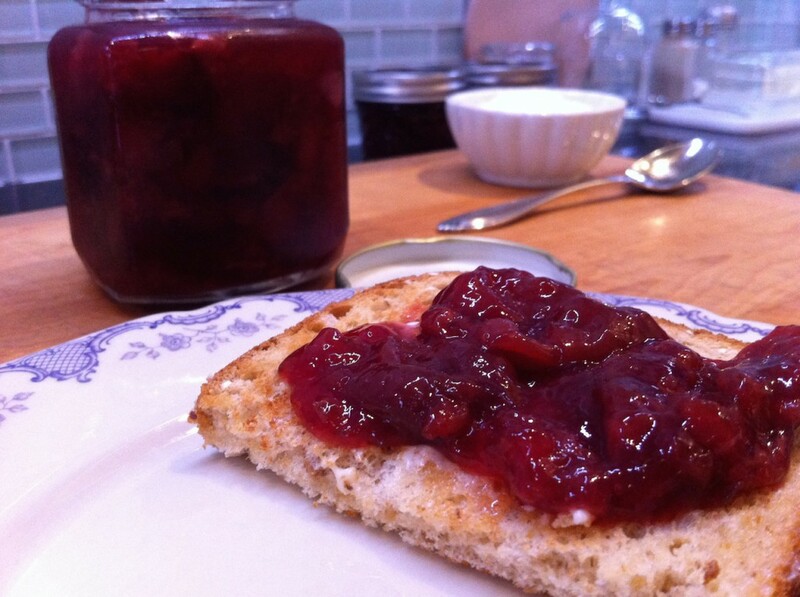 Hmm, how about a jam – I jar everything else, why not. Wait, what’s that link at the bottom of the page? (Squirrel!!) 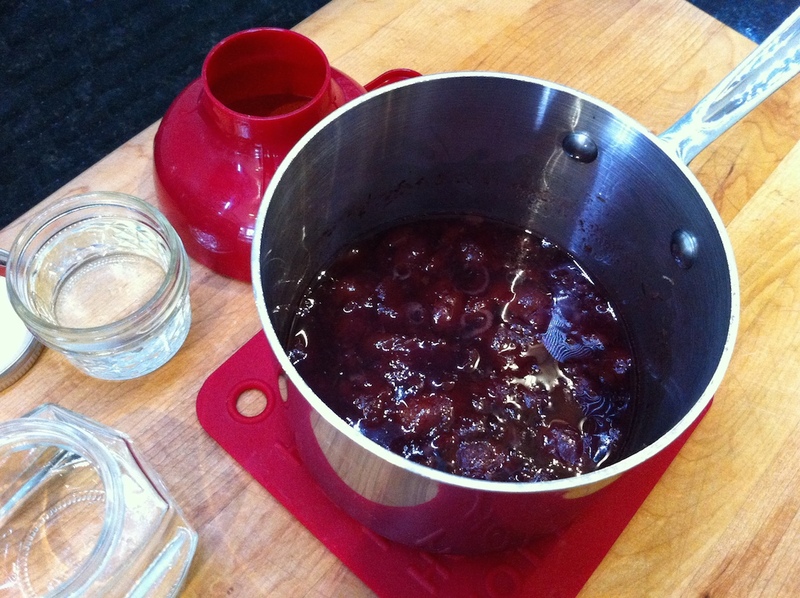 Lo-Sugar Cherry-Lime Jam, from Everyday Food ‘08 . Gasp! Could it be. Oh yeah! This is almost too easy. As I read the recipe, it was nice and simple, but it wasn’t jam. They used cornstarch as the thickener? It was pie filling. 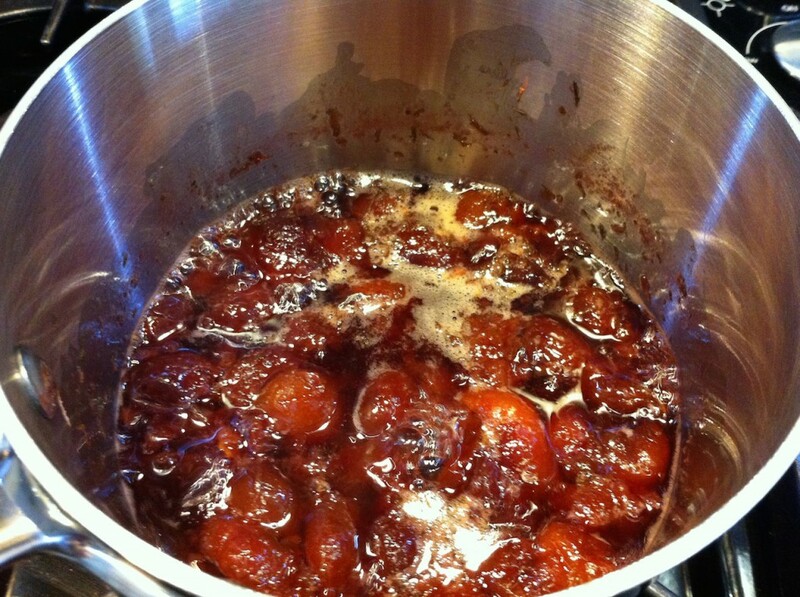 But it could be jam easily…and I’m just the gal to do it. So let’s take that Martha recipe and turn it on it’s head, bringing that summer drink to our favorite breakfast (toast and yogurt). Oh, did I mention this is good for you! And a couple of jars. This is a small recipe so I got a couple of my jars that I use for yogurt (the 4oz Ball jar), and one larger one from my more professional stash. I love the jars and lids from Fillmore Containers. They have a great selection, reasonable shipping and great service. Two thumbs up – they make my preserves look fabulous. Speaking of containers, see that measuring cup from Anchor? I just got it from, of all places, the grocery store! It’s wonderful – beakers aren’t just for the lab anymore. Don’t pass it by. 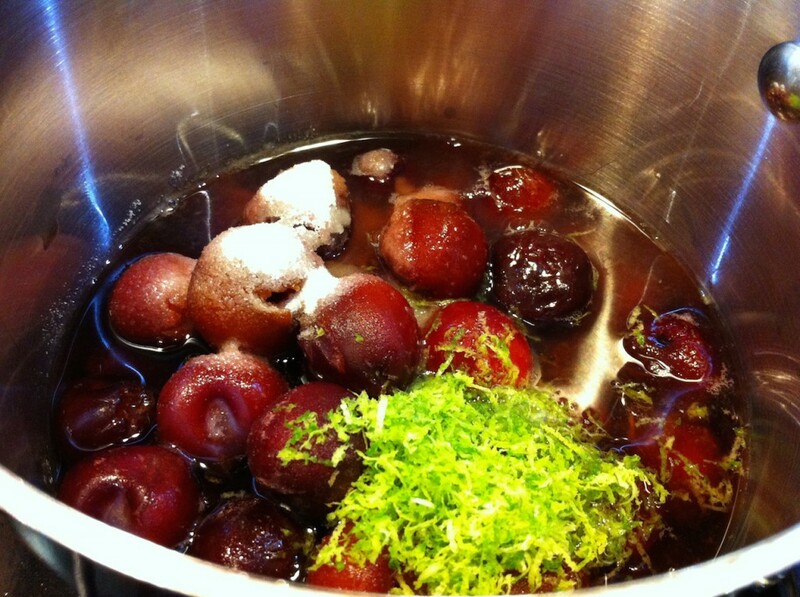 Get the cherries in the pot along with the liquids and get it cookin. 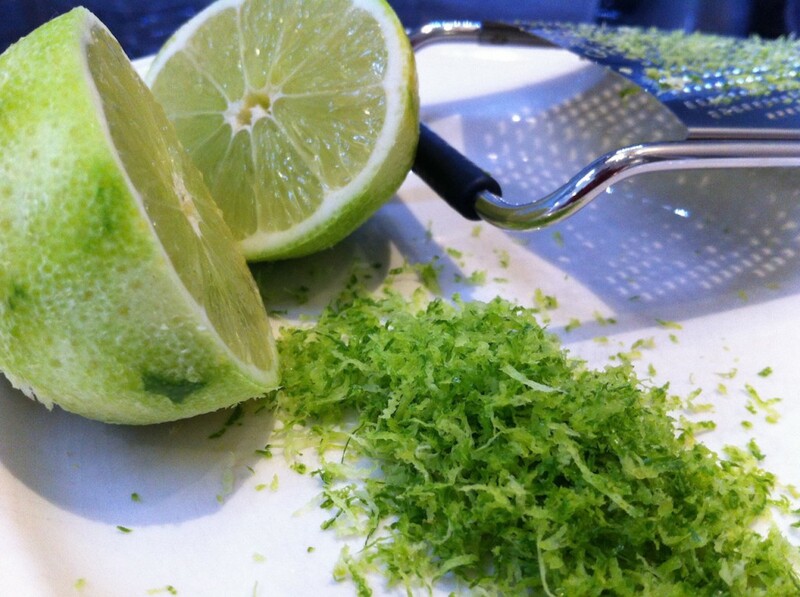 Get that lime zested, and juice it. (wash it first!) Ohhh, can you smell that!? 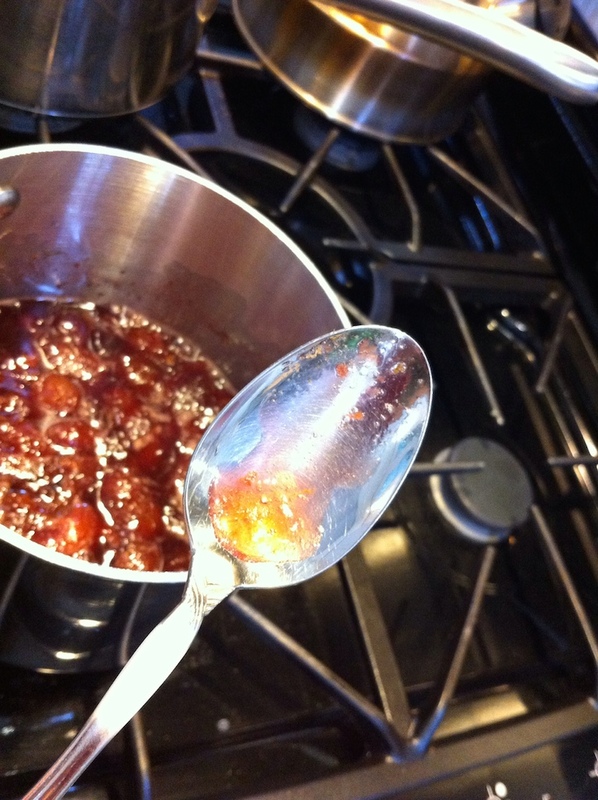 Add the zest to the pot along with the sweetener, and pectin. You may need to mash those cherries a bit. In fact, next time I’ll cut them up a bit while they’re still frozen. A pantry staple for sure. 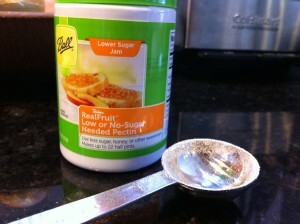 This Low-Sugar Pectin variety has become a pantry staple there. It’s inexpensive and easy to use. Luv it! Let it simmer. Maybe 15 -20 min. ? Test the ‘gel’ to see if it’s ready. OK, so since it’s just a little bit (about 14oz), I’m just going to park it in the fridge. Since I didn’t sterilize these jars, they need to be warmed a bit with some hot tap water. 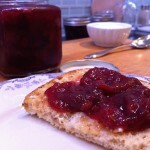 I never get tired of making things into jam! Let it cool – park it in the fridge and tomorrow breakfast will be awesome! The taste isn’t like the cherry preserves you get at the store…this is Cherry-Limeade my friends! I’ll bet you forgot that cherries are a super-food. They also have such a strong flavor that the lo-sugar makes it shine thru, with a little help from Mr.Lime. Feel free to warm some up and put it over a cup of vanilla fro-yo tonight. Speaking of warm, have you thought about it swirled into some hot-n steamy steel cut oats? Oh, yeah baby – Every Day! 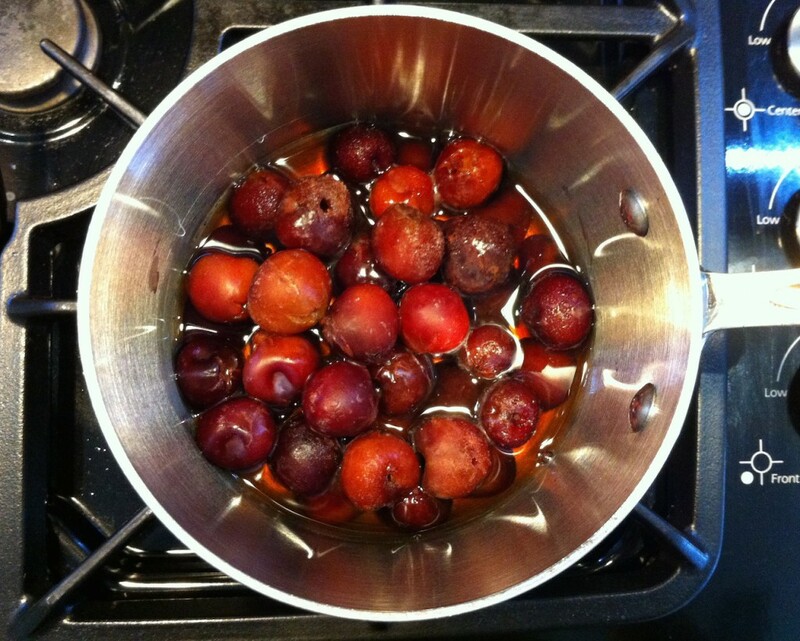 Get all the ingredients into the pot and simmer for 15 - 20 min. This is just too easy ! Make it as lo-sugar as you like. The special pectin makes it gel no matter what! I’ve got to do this one!!! !